Whether you want to do mountaineering or classic rock climbing, the Sawtooth Mountains offer almost limitless opportunities. There are world-class golden granite faces, spires, and 33 peaks over 10,000 feet. For experienced rock climbers, few would disagree that the Elephant’s Perch is Idaho’s greatest piece of stone, and an ascent there justifies a trip. Soaring over 1000 feet, this mass of granite has over 25 bolted routes waiting for your ropes and sticky shoes. The easiest and most popular route on the Perch is the 5.9 Mountaineer’s Route. Other popular classics include The Direct Beckey, Astro-Elephant, the Sunrise Book, and Myopia. The base is accessed from Redfish Lake, which is just five miles from our gate. Our friends at Sawtooth Mountain Guides can provide single or multi-day instruction and guides for all levels, including kids. Their offerings range from introductory programs on rocks at Redfish Lake to a full day on the towering “slabs” to multi-day expeditions to remote Warbonnet Peak. We can assist arranging your alpine experience with SMG, and providing information to match your abilities and experience. For those who prefer to climb mountains in lieu of rocks, the Sawtooth Mountains are quite a playground. 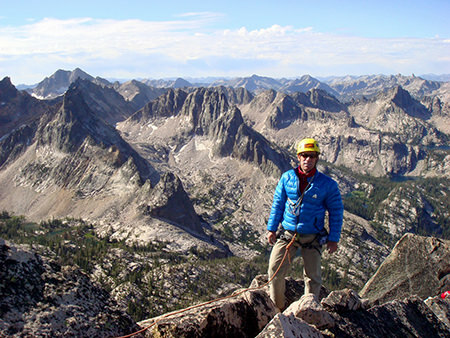 Alpine and Observation Peaks can be tackled with your determination and a hiker’s fitness level, while Thompson Peak, the Sawtooth’s highest at 10,751 feet, should be attempted by those more fearless and experienced – guide recommended. The Slabs, Elephant’s Perch, Mount Heyburn, Grand Mogul, and Thompson are all accessible by the Redfish Lake shuttle and a short hike. Finger of Fate reached from Hell’s Roaring Lake is another standout.